Pianists Yoshiko Sato and Christopher Lewis continue their concert series devoted to performances of the complete Piano Sonatas of Ludwig van Beethoven. The performances are taking place at Bennington College and at venues in the surrounding Bennington community. This concert at The Bennington Center for the Arts will be the 6th of the series. Sonata in E-flat major, Op. 81-a " The Farewell"
Yoshiko Sato studied in Keio University in Tokyo, at The Hartt School of Music in Connecticut, and at the Ecole Normale de Musique de Paris in France. Ms. Sato has given recitals in Japan, the United States, France, and Switzerland, and has appeared as soloist with the Manchester Symphony Orchestra, the Orquestra de Cambra de L'Emporda in Spain, the Hartt Symphony Orchestra, and with the Sage City Symphony. Over the years she has also won numerous prizes in piano competitions in Europe and in the United States. 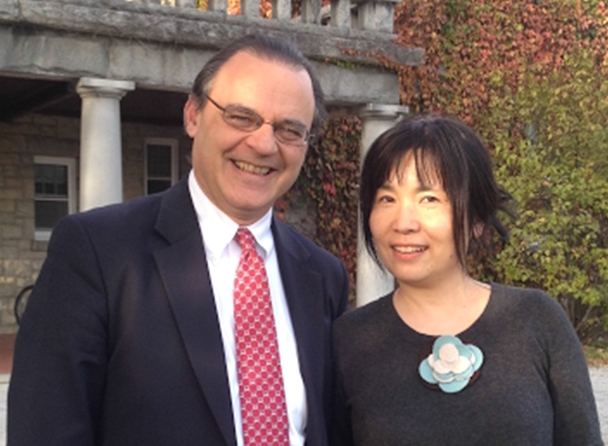 Since 1999, Yoshiko Sato has been a piano teacher and staff accompanist in the music program at Bennington College. In 2009 Ms. Sato and Tenor Thomas Bogdan released a recording of Hungarian Folk Song settings by Bartok and Kodaly. Sato's recordings of Allen Shawn's Childhood Scenes, and Nocturne for Y can be heard on CDs from Albany Records. In 2014 she performed Childhood Scenes as well as Shawn's Jazz Prelude No. 2 for the Antonia Franceschi Dance Company at the Ailey Center in New York City and in performances on the island of Malta. In fall of 2015, she and her colleague pianist Christopher Lewis embarked on a concert series devoted to the complete piano Sonatas of Beethoven. Christopher Lewis has taught and performed throughout the U.S., Italy, and British Columbia in venues including Carnegie, Weill, and Alice Tully Halls in NYC, Orchestra Hall in Detroit, the Empire State Performing Arts Center in Albany, and the Southern Vermont Arts Center. Lewis was a prizewinner in the American National Chopin and the NY Leschetizky Society Competitions and has recorded for the Newport Classics label. He held faculty positions at New York University as well as several private schools in New York City and has been on the piano faculty of Bennington College since 2010. Doors open at 7:30pm, performance begins at 8:00. Free admission, donations welcome.